The objective of this preparatory action is to collect information from seawater and brackish water desalination plants (SWDP and BWDP, respectively), such as brine compositions and process characteristics. 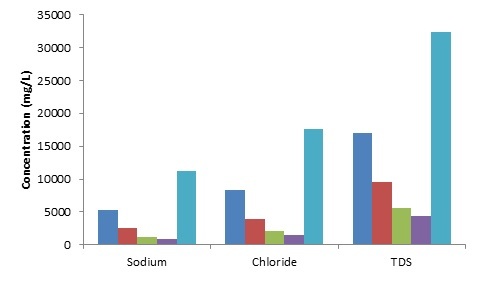 Brines from six different seawater desalination plants (1 – Murcia and Almería, Spain; 2 – Skikda, Argelia; 3 – Tyrrenian Sea; 4 – Chennai, India; 5 – Qingdao, China) have been compared in terms of their compositions, and the obtained results show that the variability between different samples is around the 20% for most of the ions. 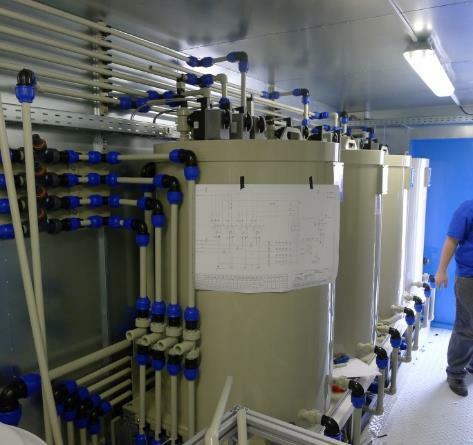 Analysing the collected data, it has been observed that the main parameters affecting the brine composition obtained in a seawater desalination process are the seawater composition and the recovery of the reverse osmosis process. 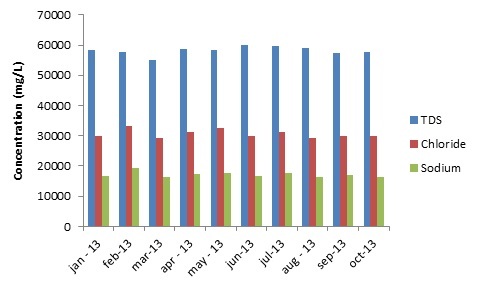 On the other hand, brines from eleven brackish water reverse osmosis processes have also been analysed. In this case, the differences observed were much higher compared to seawater plants. The objective of this action is to collect historical data from the desalination plants in Almeria and El Atabal, technical details on the current desalination process and seasonal brine compositions, in order to design the brine treatment pilot plant and to obtain the necessary data to quantify the environmental and economical impact of the proposed technology. Figure 1. Seasonal variation of total dissolved solids (TDS), chloride and sodium in Almería seawater desalination plant (left) and El Atabal brackish water desalination plant (right). 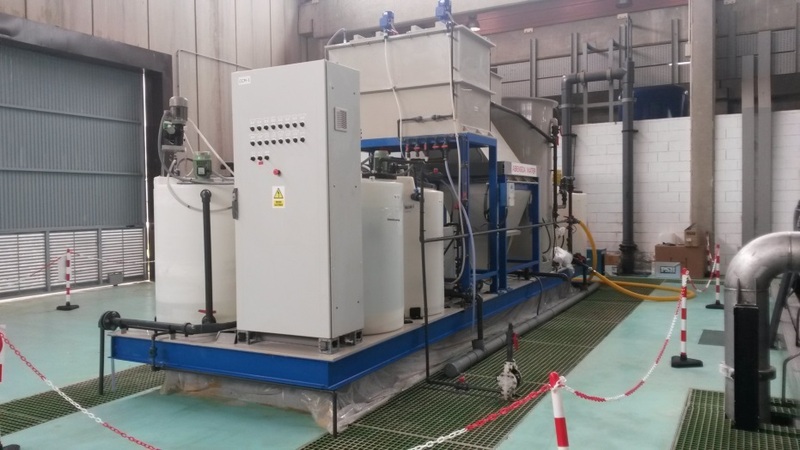 The objective of this action is the design and construction of the electrodialysis metathesis (EDM) stage of the brine treatment demonstrative plant. Three different membrane pairs manufactured by FUJIFILM (standard product and new generation membranes) as well as two commercial membrane pairs have been characterized under high salt concentrations. Permselectivity, electrical resistance, water transport and energy consumption have been measured in order to select the most suitable membranes for the proposed EDM application. Furthermore, for the design of the EDM pilot plant, bench-scale experiments were performed. 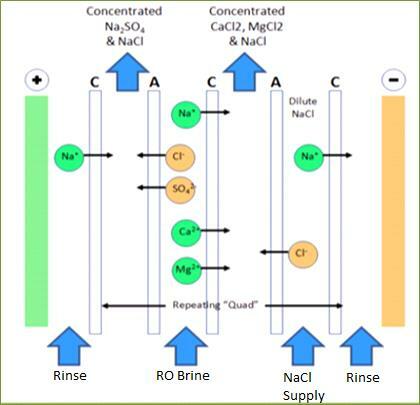 Water quality and EDM performance parameters were monitored to evaluate: 1) the effectiveness of EDM in separating the concentrate into two streams of highly soluble salts and 2) energy requirements for desalination of the reverse osmosis brine feed by EDM. After defining the best EDM configuration, we proceed to construct the EDM pilot plant inside a container to facilitate the transport and installation at the desalination plants. Figure 2. Configuration of the EDM process. Figure 3. EDM pilot plant. The objective of this action is evaluate different strategies for the recovery of valuable compounds. Using representative brine compositions from the Almería and El Atabal desalination plants, as well as other desalination plants, simulation studies (chemical speciation software) and preliminary evaluations at bench scale (precipitation experiments) have been performed in order to find which valuable compounds can be easily recovered. Considering the results obtained in both, simulations and precipitation experiments, the most promising precipitation routes to be applied for Almería and El Atabal brines have been selected. The necessary data to design the Zero Liquid Discharge (ZLD) stage were obtained. The main objective of this action is to construct a ZLD system to be applied after the EDM stage in order to recover valuable compounds from brines and to reach the ZLD process objective. 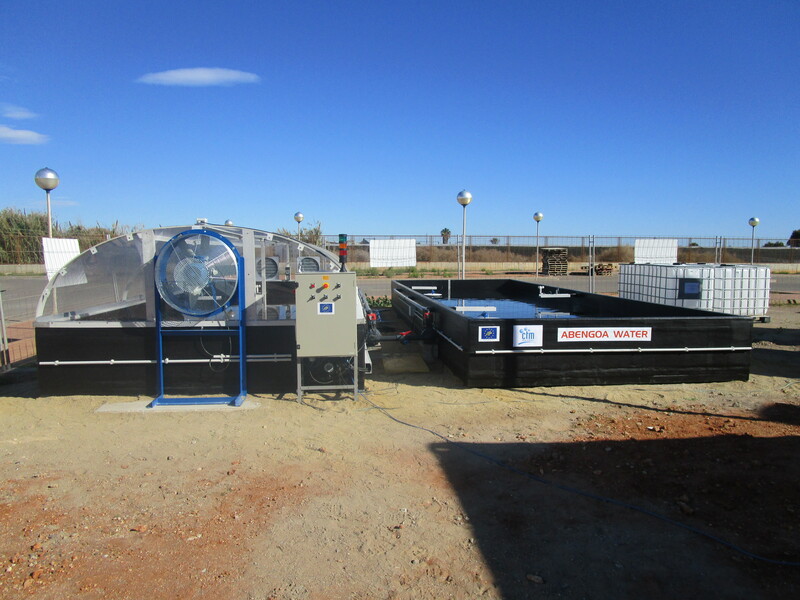 The ZLD system will consist in three stages: brine purification, brine concentration and intensive evaporation. 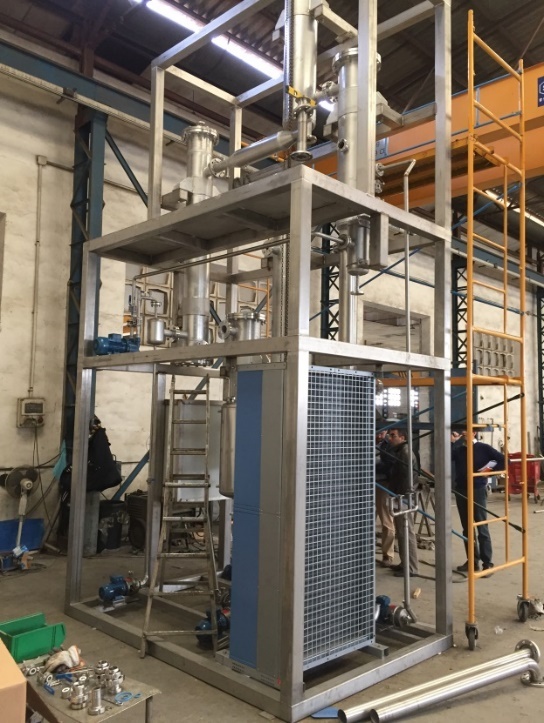 1 - Brine Purification BP (Pilot plant unit designed to purify high saline effluents): The plant includes a carbonic species removal system controlled by adding inorganic acids such as hydrochloric or sulfuric acid. The acidified brine is mixed with the adequate reagents during a defined retention time in the reaction tank. The effluent is then brought to a flocculation chamber with gentle agitation where it is retained for 15 minutes. The use of flocculants is recommended to enhance flock formation, thus resulting in faster settling rates. The treated effluent, which contains insoluble salts, is directed to a clarifier where the solids settle to the bottom from where they are withdrawn to a sludge holding tank. The purified brine is directed to a storage tank for further treatments. Figure 4. Brine purification plant. 2 - Brine Concentrator BC (Pilot plant unit designed for brine volume minimization): The BC pilot plant can operate under falling film (ff) or forced circulation (fc) and under different vacuum levels. This plant has an evaporation capacity of 50 l/h and the concentration factors achieved will depend on the brines composition. The plant includes the following elements: evaporator, condenser, feed storage tanks, temperature and pressure indicators, pumps (feed, concentrate, distilled, ff and fc recirculation, and vacuum), liquid-vapor separator, pre-heater, boiler, air-coolers with double fan, rotameters (feed, concentrate, distilled and ff recirculation), electrical switchboard. Figure 5. Brine concentrator plant. 3 – Intensive solar evaporation (ISE) (Pilot plant unit designed to precipitate the salt contained in the high saline effluents): The water evaporation is carried out by solar energy and air dissecant capacity, enhanced by solar high temperatures and high air flow speed. 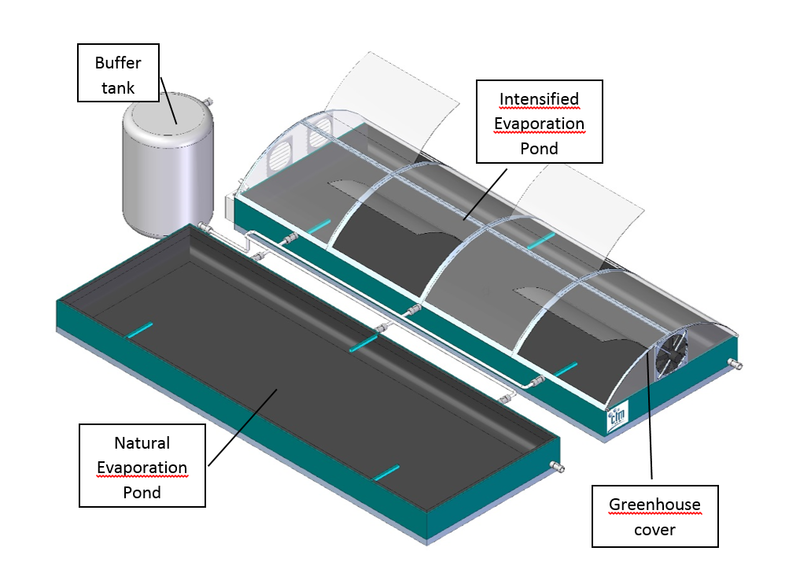 The Intensive Solar Evaporative technology has been designed taking into account minimal air volume contained within the greenhouse, control of the brine depth, control of temperature and humidity, thermal isolation of the ponds, collection of the cover condensates, and considering air flow speed over the evaporation film. Two ponds have been constructed for comparison, one for natural evaporation and another one for intensified evaporation. Figure 6. Evaporation ponds for natural (left) and intensive (right) evaporation. 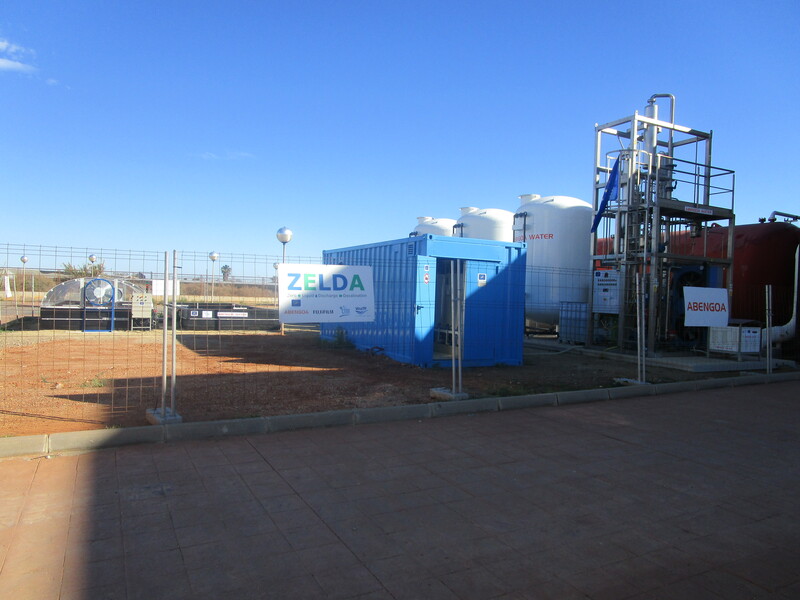 The objective of these actions is to test the EDM-ZLD pilot plant in the real desalination plant of Almería operated by ABENGOA. 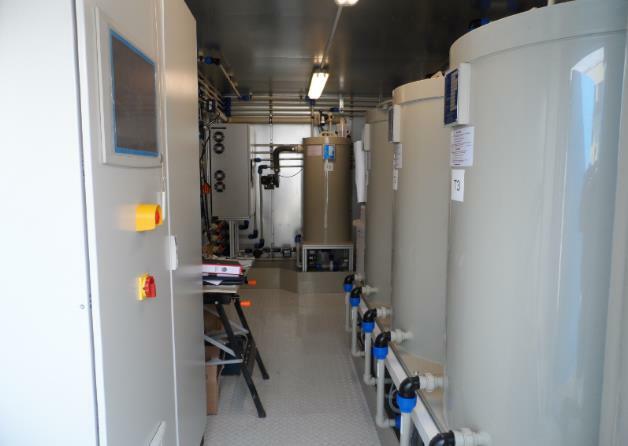 Although the initial plan was to install the pilot plants in two differents sites, in Almería and in El Atabal, finally the consortium decided to install only the pilot plant at Almería SWDP and transport brine from Helios and El Atabal BWSPs using tank trucks to Almería for their treatment. The plant is currently operating with brine from Helios thermosolar plant. During 2016 and 2017, brines from El Atabal and Almeria will be tested. The plant is continuously operated to assess and demonstrate its capacity to increase the water recovery of the desalination process and to recover valuable compounds in order to reach the zero liquid discharge. Figure 7. Pilot plant in Almería. During this action, different indicators have been created and will be monitored in order to establish the impact of the project from the technical and socio-economically point of view. To demonstrate the environmental benefits and the economical sustainability of the new brine treatment process, Life Cycle Assessment (LCA) and Life Cycle Cost Analysis (LCC) methodologies are being applied to the results obtained in both SWDP and BWDP brines. The model for LCA and LCC has been developed and implemented in Excel® spreadsheet attached to the specific LCA software Simapro developer. 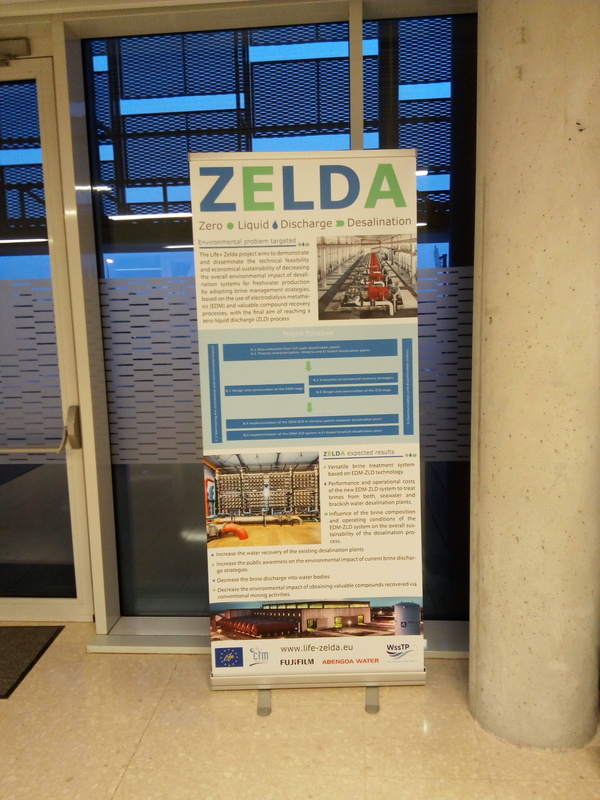 This model allows to analyse the environmental and economic sustainability of the EDM-ZLD as well for current alternatives for brine management. Life Cycle Assessment (LCA) has been conducted following the precepts set out in ISO 14040 series and UNE 150041. A set of indicators for the assessment of the socio-economic effects of the technology proposed and strategies for its measurement have been selected. When pilot plants will be fully operative, these indicators will be quantified in connection with SCADA system and updated in the project every month. The communication and dissemination plan has been structured in a series of tasks aimed at disseminating the development of the project and the results that are being obtained to the target audience. Some tasks are devised for stakeholders that could benefit from the project's results while other tasks are designed as communication or information activities to the whole community, including the general audience. The ZELDA website, information boards and brochures have been created so far. Soon a new section will be added in the website, the "Website Experimental Data", where real data from the pilot plant performance will be displayed. Open days to visit the pilot plant performance in Almería are foreseen for 2016. Furthermore, a workshop addressed to administrators and politicians will take place in Brussels in September 2016. Another workshop intended for networking with other related R&D projects will take place at CTM facilities in Manresa at the end of 2016.